The secret strategy, based on ancient Chinese statecraft, produced a large-scale transfer of cash, technology, and expertise that bolstered military and Communist Party "superhawks" in China who are now taking steps to catch up to and ultimately surpass the United States, Pillsbury concludes in a book published this week. The Chinese strategic deception program was launched by Mao Zedong in 1955 and put forth the widespread misbelief that China is a poor, backward, inward-looking country. "And therefore the United States has to help them, and give away things to them, to make sure they stay friendly," Pillsbury said in an interview. "This is totally wrong." The Chinese strategy also is aimed at gaining global economic dominance, he says, noting that China’s military buildup is but one part. 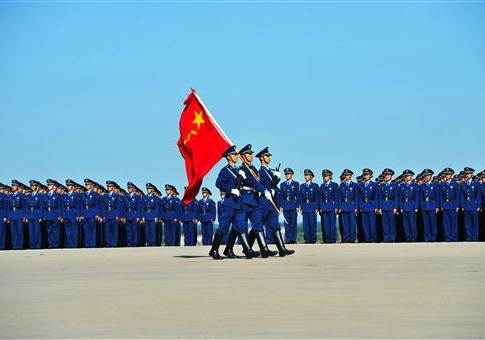 The combined economic, political, and military power is seeking to produce China as a new global "hegemon" that will export its anti-democratic political system and predatory economic practices around the world. In the interview, Pillsbury, currently director of the Hudson Institute’s Center for Chinese Strategy, said new details contained in the book were cleared for publication by the FBI, CIA, and Defense Department, including details of formerly classified presidential directives, testimony from previously unknown Chinese defectors, and alarming details of writings from powerful Chinese military and political hawks. The book also discloses for the first time that the opening to China in 1969 and 1970, considered one of the United States’ most significant strategic gambits, was not initiated by then-President Nixon’s top national security aide Henry Kissinger. Instead, Pillsbury shows that it was Chinese generals who played the United States card against the Soviet Union, amid fears of a takeover of the country by Moscow. Some sensitive details were removed from the manuscript by the government. However, the totality of the book represents an authorized disclosure of China’s secret strategy that is among the most significant releases of internal U.S. government information in over a decade, Pillsbury said. "That highlights the importance of the book," Pillsbury said in an interview. "And it sends a message to China: We’re not as clueless as you think." Pillsbury also reveals how a Chinese government defector exposed Beijing’s effective lobbying campaign from 1995 to 2000 that led Congress to approve Most-Favored National trade status for China—several years after China was sanctioned for the bloody massacre by the military of unarmed protesters in Beijing’s Tiananmen Square. That covert influence program was revealed by one of the six Chinese defectors Pillsbury questioned over the years, including one who turned out to be a false defector—FBI informant Katrina Leung, who was arrested in 2003. "I tried to put a defector interview into the opening of each chapter," Pillsbury said, noting that the defectors remain in witness protection programs and "fear for their lives" due to the possibility of Chinese retaliation. The defectors disclosed details of "what China is trying to do to America in what they call the 100-year marathon," he said. On the Chinese hawks, Pillsbury said internal writings of these powerful political and military leaders revealed "how they draw lessons from China’s ancient past … and how can they surpass America without the Americans reacting." Pillsbury, whose most senior government post was assistant undersecretary of defense for policy planning in the administration of President Ronald Reagan, also worked for several senators and has been a consultant on China policy for decades. In the book, Pillsbury acknowledged that initially he was among the staunchest advocates of the U.S. policy of "constructive engagement" toward China launched initially in 1969 as a way to prevent a Soviet takeover in Beijing. Asked when he abandoned his pro-China, "panda hugger" views, he said: "Over time … mainly after Tiananmen"—a reference to the brutal 1989 military crackdown on pro-democracy protesters in Beijing’s main square. "We believed that American aid to a fragile China whose leaders thought like us would help China become a democratic and peaceful power without ambitions of regional or even global dominance," Pillsbury wrote. "Every one of the assumptions behind that belief was wrong—dangerously so," he stated, noting that the power of China’s now dominant faction of anti-American ultranationalists was underestimated. Pillsbury’s book, The Hundred Year Marathon, reveals new details of secret CIA cooperation with China in covert action programs in Afghanistan and Angola, as well as nearly $1 billion worth of weapons transfers during the 1980s. The covert support for China, along with a continuing flow of U.S. technology and intelligence for the past 45 years, were once among the U.S. government’s most closely guarded secrets. The book also declassifies details of several presidential memoranda behind the covert U.S. policy of supporting China that Pillsbury states produced one of the United States’ most significant strategic blunders. Documents and intelligence reports smuggled out of China after the bloody Tiananmen massacre, when tanks were called in to disperse tens of thousands of unarmed pro-democracy protesters, revealed that senior Chinese leaders were sharply divided over supporting the students’ calls for democratic political reform, according to the book. Communist super hawks in the military and senior Party leadership managed to defeat and ultimately arrest senior Party officials who supported the pro-democracy reform. Chinese hardliners promoted the book of Col. Liu Mingfu, "The China Dream" that is the inspiration behind current Chinese leader Xi Jinping’s increasingly Maoist policies. Other writings by hawks reveal a future China-dominated world will that values "order over freedom, ethics over law and elite governance over democracy and human rights." U.S. intelligence agencies for decades underestimated the influence of Chinese hawks and continue to dismiss their power and influence as "fringe" elements. Intelligence assessments in the late 1980s failed to recognize the pro-democracy sentiment inside the ruling Politburo was strong until it was crushed after the 1989 crackdown on dissent. After Tiananmen, China’s government created a false history to hide its past covert cooperation with the United States. China’s "assassin’s mace" weapons—missiles and other exotic arms—are being built to defeat satellites and knock out aircraft carriers, using high-tech arms, including electromagnetic pulse weapons. As part of covert U.S. offers of assistance to China in the 1970s, the CIA cut off aid to the exiled Tibetan leader the Dalai Lama and canceled U.S. Navy patrols through the Taiwan Strait. Instead, the CIA began providing intelligence on the Soviet Union to China. Reagan agreed to sell six major weapons systems to China but required that continued aid be conditioned on China remaining unaligned with Moscow and liberalizing its communist system. The arms transfers were halted after Tiananmen. World Bank assistance to China imposed no conditions on China moving toward free market reforms. As a result, China’s government today continues to control most industries. China will undermine the United Nations and World Trade Organization to "delegitimize" the U.S.-led world order in order to promote its global system. An internal secret briefing for Chinese officials discussed China’s most important foreign policy priority as "how to manage the decline of the United States," revealing that China is working against U.S. interests in supporting rogue states and selling arms to America’s enemies. To counter what Pillsbury describes as China’s "warring states era" strategy for world dominance, an approach that outlines how a lesser power can defeat a stronger foe, the United States needs to recognize the threat and take urgent steps to prevent China from dominating the world. Pillsbury said that as part of efforts to counter the Chinese military buildup, the Pentagon’s next budget will include funding for up to 100 new long-range bombers, funds for hardening U.S. satellites against Chinese attacks, and money for a Navy program to protect U.S. aircraft carriers from China’s carrier-killing DF-21D anti-ship ballistic missile.